Investment Tax Credit (“ITC”) – Purchasers can take a tax credit equal to 30% of their basis in a new solar system. Bonus Depreciation – Business owners of solar systems put in place before the end of 2017 are eligible to depreciate 50% of their basis in the first year. Accelerated MACRS Depreciation – Businesses can depreciate solar systems using a 5-year schedule even though the useful life of a solar system is 30-35 years. These benefits have value because they reduce the amount of taxes a business would otherwise pay. For example, suppose a business would owe the government $1 million in income taxes in the absence of any solar investment, but it now invests $600,000 in solar systems. It takes a tax credit—that is, a direct reduction of its taxes—of $180,000. It also claims bonus depreciation of $255,000 and accelerated MACRs depreciation of $51,000 in the first year. If its tax rate is 35%, this reduces its tax burden by another $107,000. The business has reduced its taxes in the first year by $287,000, or nearly half of its solar investment. This reduction in the taxes the business would otherwise owe is effectively the federal government’s subsidy of solar. Of course, in order to take direct advantage of these incentives a business must have a tax liability to begin with. Many solar dealers and developers do not have sufficient such liabilities; to use the incentives they partner with tax equity investors as described below. According to IRS rules, the business must reduce its basis in the equipment by 50% of the ITC, so the starting depreciable basis would be $600,000 – 50% * $180,000, or $510,000. Under current law, bonus depreciation will phase out as follows: 40% in 2018, 30% in 2019, 0% in 2020 and beyond. The ITC will also decrease over time: 26% in 2020, 22% in 2021, 10% thereafter. The American Recovery and Reinvestment Act of 2009 allowed companies to take a cash grant of 30% of their basis in a solar system from the U.S. Treasury in lieu of the ITC. These grants are often referred to as “Section 1603” grants after the section of the law that created them. They expired at the end of 2011. One critical consideration in determining the value of the ITC and depreciation benefits is how much one can claim as the basis against which one is claiming the benefits—the larger the basis, the larger the tax benefit. A company’s basis is generally the amount of its investment in the property. When a project is sold by a dealer or developer to an unrelated third party, the new owner’s basis is clear—it is what it paid for the system. The market approach is based on the sale of comparable properties. In other words, the price that similar systems in similar locations have sold for between unrelated parties. Finally, the income approach uses the discounted value of future cash flows of the project. Treasury is least comfortable with this approach because it relies on assumptions that are difficult to verify or that require a lot of judgment. For example: the appropriate discount rate (we have seen developers use everything from 6-10%), the terminal value of the systems, and future rates of inflation and taxes. Although Treasury is uncomfortable with the income method, we understand the IRS uses this approach internally. FMV is a critical issue because (presumably) everyone wants to comply with the law but everyone also has an incentive to claim the highest FMV possible. This is not to be taken lightly: the Departments of Treasury and Justice have issued subpoenas to a number of companies in the industry investigating the possible misrepresentation of FMV for 1603 grants. However, companies that are conservative will receive fewer tax benefits than those that are more aggressive but still follow the law. A Treasury summary of these three approaches is available at http://www.treasury.gov/initiatives/recovery/Documents/N%20Evaluating_Cost_Basis_for_Solar_PV_Properties%20final.pdf. Unfortunately, many businesses that invest in solar systems do not have significant tax liability. While an individual company that buys its own solar system might be able to use tax incentives efficiently, no business we know of that specializes in the installation or financing of solar systems for others has enough tax liability to be able to use all the federal tax benefits itself. As a result, these businesses often seek tax equity investors—investors who can use the tax benefits—as partners. The arrangements used are complex and the number of parties that have been willing to invest in tax equity has been limited. As a result, both the administrative costs (in terms of legal and accounting fees) and financing cost (in terms of rate of return required by tax equity investors) are high. As of this writing, tax equity investors require 7.5-9.5% for unleveraged projects. This is the after-tax return to the tax equity investor, net of its tax benefits. The cash return to the tax investor and cost of capital seen by the developer are lower. In addition, most tax equity investors will only join in funds intended to finance at least $75-100 million within one year, which is more capital than most developers can deploy. 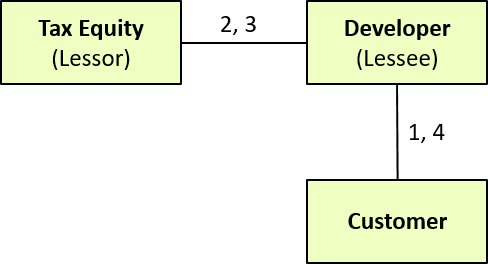 The market uses three main structures used for tax equity investments: sale-leasebacks, partnership flips, and inverted leases (also sometimes called lease pass-throughs). 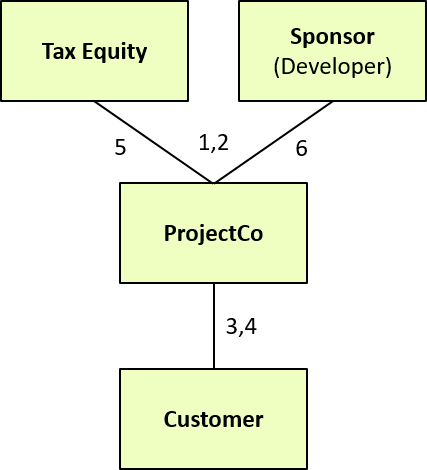 In partnership flips, the developer (also referred to as “the sponsor” because it sponsors and manages the project) and tax equity investor form a joint venture partnership and the allocation of profits, cash, and tax benefits “flips” between the parties one or more times during the life of the partnership. These flips allow the sponsor to invest alongside Tax Equity so it retains a residual interest in the systems after their installations, and they allow the transfer of most (typically 99%) of the tax benefits to the tax equity investor. They also allow the sponsor to regain 100% ownership of the assets at reasonable cost after all the tax benefits have been used by the tax investor. The partnerships are organized as limited liability companies so there are no income taxes at the partnership level; taxes are paid by the investors on their own corporate tax returns. The vast majority (usually, but not always, 99%) of the profits, losses, and investment tax credits from the partnership flow to the Tax Equity for the first several years, after which these attributes “flip” and the sponsor gets the majority of them (usually, but not always, 95%). The flip is designed to happen as early as the end of year five or as late as year nine, and is supposed to coincide with a time when Tax Equity will have received a certain target rate of return, net of all tax benefits and cash it is distributed. The flip cannot happen before the end of year five or the government will recapture a portion of the ITC. One important concept to understand when dealing with partnership flips is that the cash generated by the partnership can be distributed to the partners in a completely different ratio than the tax profit or loss. For example, while the tax equity investor may get 99% of the tax profit or loss before the flip—and it is usually a loss, which is what reduces its net corporate tax payments—it usually gets a minority of the cash generated from lease payments and other sources. Most of the cash goes to the sponsor. The sponsor usually has the right to purchase Tax Equity’s position after the flip. The buyout price is usually the greater of fair market value at the time of the buyout or the amount that would give the tax equity investor its required rate of return. In any event, because after the flip Tax Equity only gets a small minority of cash distributions, the buyout price is quite reasonable (compared with the price in a sale-leaseback). There are two major sub-types of the partnership flip. The so-called yield-based flip is the most popular. Tax Equity gets the vast majority of the tax benefits plus enough cash to get its required after-tax IRR at an expected target flip date. If the assets underperform, the flip is delayed until Tax Equity gets its agreed return. Some banks, including especially U.S. Bank, do flips in a slightly different way. In this “fixed flip” model, Tax Equity gets a fixed preferred return of about 2-3% of their investment up to the flip in addition to the tax benefits. The flip happens at the end of year 5 or 6 irrespective of whether Tax Equity received its target return. (The 2-3% preferred return plus the tax benefits will yield the target return with high probability.) Fixed flips make sense if tax rates are stable; we expect they will become less popular going forward, given all the talk in Washington about possible changes to tax rates. It is possible for ProjectCo to use debt. This is not shown in the Figure 2 for simplicity. Using debt at the project level is rare. For more information on partnership flips, see our more detailed article on their mechanics and accounting, Tax Equity 201: Partnership Flips. Tax Equity leases systems from Developer. Tax Equity is eligible to receive 100% of ITC. Customer pays Developer after end of lease term. Lease term is typically 12 years. A partnership inverted lease structure involves two partnership entities. First, the developer and tax equity investor fund a “master tenant”. Tax Equity provides almost all of the funds and owns 99% of the master tenant. 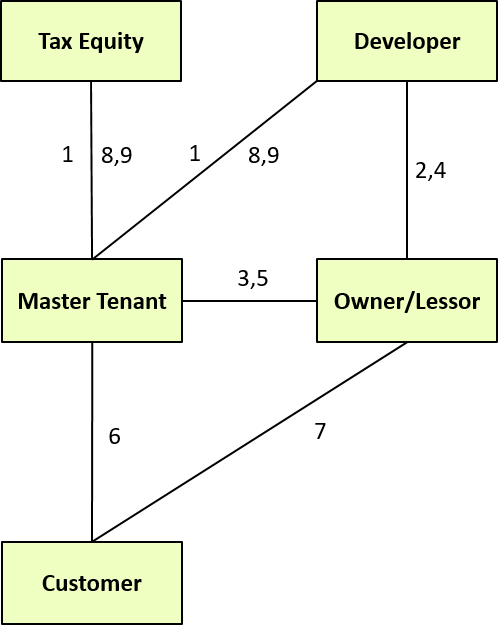 Next, the developer and master tenant fund an “owner/lessor” to own and lease the systems to the master tenant. The developer typically owns 51% of the owner/lessor. Some developers prefer this structure because it allows them to keep half the depreciation tax benefits. Owner/Lessor leases system to Master Tenant. Owner/Lessor also makes election to pass through ITC benefits to Master Tenant. Master Tenant sub-leases to Customer. Customer makes monthly payments to Master Tenant, which “passes through” a portion of them to Owner/Lessor. What is the cost of installation, including a reasonable profit? How many systems will be installed during the life of the fund (which is typically less than a year)? How much total funding will be required? How much of this funding will tax equity provide? How much must be provided by the developer? By debt? How much revenue will the financed systems generate? From lease or PPA payments? From state grants or rebates? From the sale of renewable energy credits the systems generate over time? How will these revenues increase (or not) over the life of the assets? What proportion of customers will fail to pay their bills? What will be the salvage value of the systems at the end of the lease or PPA term? What will the operating expenses for the systems / fund be? For operations and maintenance? For billing and collections? For fund management, accounting, and legal filings? How will this escalate (or not) over the life of the leases? How will these expenses change over the life of the leases? How should the systems be depreciated for book and tax purposes? What setup expenses will each party incur to get the investment fund off the ground? How should the profits (losses), investment tax credits, and cash of the partnership be divided among the owners so as to give them their required rates of return while complying with potentially complex partnership tax law? Given all the assumptions above, what are the IRRs for the tax equity investor and developer? Woodlawn has developed Microsoft Excel models for each structure; they are available at our web store. Woodlawn would also be happy to answer any questions you might have about tax equity structuring and investments. Please feel free to contact us. Excellent explanation and diagrams showing development of finance methods! Thank you Josh, as a solar installer looking to become a developer, this was the initial primer that I was looking for. I look forward to learning more, hopefully from you. Your clear and concise style is much appreciated. Hey, for someone who is unfamiliar with financing, this article is describing common ways that consumers get their purchases of systems financed? Or is this only applicable to situations where developers are installing a system at a consumers property and the consumer does not technically own the system, but instead are only leasing the right to use it? Either way thanks for the informative article. Steve, the article is not for consumers. It describes how businesses that own systems and lease them to consumers can take advantage of federal tax benefits. Josh – nice piece. A question. Your statement that the MACRS benefits flow through pro-rata to the Developer and the Tax Investor contradicts a Chadbourne presentation (John Marciano). Is there an error in your work? No. In his piece John is referring to the Master Tenant, which cannot take depreciation. My comment was referring to the Owner/Lessor, which is a different entity and can take depreciation, which can be allocated to each of the partners. I have been approached by a catholic property which recently paid for solar on ground next to its buildings (went into service last week). They were not aware of the ITC benefits (which they can’t use). Is it possible for them to sell the PV to a tax appetite investor who can use the ITC since the project was just completed? John, theoretically they could sell the system and lease it back (sale-leaseback) if they do it within 90 days of start of operation. The other two structures require the ownership be in place when the system starts operation. The church missed the boat. To qualify for the sale-leaseback exception, you need two things that you don’t have here. 1) The project needs to be placed in service by someone that could have claimed the ITC (not a church). 2) The project needs to be leased to someone that could have claimed the ITC (not a church). Great piece, Josh. I’ve worked on utility-scale solar (levered flip)and have a few questions. I’m curious to know the sorts of structures have been deployed by funds set up by SolarCity for example. Presumably the structures vary based on type of tax investor(s) in each fund. Separately, I assume that additional projects can be tagged on as those are developed under all of these structures or am I off? Lastly, from a commercial perspective, I wonder if the tax equity funds usually charge some sort of commitment fee (after all, most tax investors are banks) on undeployed capital/undrawn funds? Thanks. Senake, I believe SolarCity has used all three of the structures I describe in the post. I imagine they are doing few, if any, sale-leasebacks at this point because they want to own the residual value. The funds are set up so projects can be added after the fund is set up. In fact, for flips and inverted leases the funds have to be in place before the projects are placed in service. Finally, although I don’t know this is true in every case I believe tax equity usually doesn’t charge a commitment fee or penalty since they are technically equity, not debt, investors. Great Article. Do you have a catalogue of all your work pertaining to Solar PV? can the real property, the actual land purchased be considered as part of the investment? and included in the basis for iTC? Mike, you can consider it part of your investment, but I don’t think you can included it in your basis for the ITC. We are partnered with a Solar LLC and allow our tax clients to join the LLC and receive pass through energy credits to use to offset their own tax. The LLC typically gets 90 cents on the dollar for this transfer using A K1 and forms 3468 and 3800. Have you heard of this? We haven’t worked with that in particular, but that doesn’t mean it can’t work. It sounds like you may want to contact a tax attorney. One thing to ask about / consider is passive activity limitations. Thank you for the excellent article and insights into how tax equity structures work. But once you do have everything structured correctly, how do you find these tax equity investors? Can I as a smaller developer goto the ones you mentioned the more established players work with? You probably should not be selling or structuring deals without knowing who your tax equity investors will be. In my experience the ones I list in my article are only interested in working when they can put tens of millions to work in one transaction. Smaller developers have a few options. One: work with clients that have some desire to invest in the solar system and can use the credits on their own taxes, but who don’t want to own the whole system. Two: form a relationship with a larger developer who will buy your projects from you before they are financed. Third, Work with a bank or other investor who will buy the whole project. Thanks for the article, Josh. This is really helpful. In modeling out the cash flows, how much of the tax benefit actually accrues to the developer? Does the tax equity investor provide the developer with some small and discounted amount upon project completion and then realize all of the tax benefits (ITC and MACRS) over the subsequent 5-year period? Also how would participation by a YieldCo change the cash flows? Thanks! How much of the tax benefit accrues to the developer depends on the structure. For example, in the sale-leaseback it is zero, but in the flip and inverted lease some of the benefit does get allocated to the sponsor, but the specific amount depends on both the structure and what the parties negotiate. Many sponsors (developers) have no tax liability, so they try to minimize the amount of the tax benefit they receive. A YieldCo does not change the fundamentals of these structures, but one has to make sure that the ownership of the assets does not change in a way that would trigger the IRS to recapture the tax benefits. I am looking to add a PPA option for our clients. We would not be looking to do tons of them a year (maybe 10-20), however would like to keep it separate from the existing company for payments and such. Looks like the Sale-leaseback set up would work the best for this? Instead of leasing back to the installation company could the payments go directly to the PPA for simplicity? That seems right. Your development company would sell the solar system to someone (perhaps a bank). The bank would lease it “back” to a new, separate company you form. Then the customer’s PPA payments would go to that new company. Hi Josh: brilliant article. Under the Flip scenario, is the buy-back price pre-determined? Are there any tax requirements that the buy-back has to be FMV. If not, what is the typical price range? Is it based on the original transfer price, or is it a multiple of PPA annual payments? The buyout option price can be predetermined, but it has to be a reasonable estimate, at the time of closing, of the FMV at the time the option is to be exercised. are there any special requirements for the tax equity investor Lessor? For instance, I heard that the lessor needs a special lending license and only banks can really do this. Ben, I’ve never heard that you need a special lending license to do a sale-leaseback. Tax equity investors generally tend to be widely held C corporations (not individuals or small partnerships), however, because the ITC can only be used to offset passive income (which most individuals do not have) unless the investor is actively involved in the operation of the solar system. Are banks able to raise tax equity funds? (accept investments from investors and pool the funds to invest) Or do they just invest their own money? Regulated banks probably could not raise tax equity funds, although a bank holding company may be able to. However, we’re not aware of any banks that have raised their own funds. Now that bonus depreciation is back for solar PV and given the fact that tax equity partners seem to funding approximately 50% of the deal. The benefits of ITC and bonus depreciation in the first year will cause a negative account balance. Do tax equity partners tend to shy away from bonus depreciation deals as a result? Do you have an approximate % ratio of tax equity partner participation in solar deals that claimed bonus depriciation a few years back? Yes, you are right about the negative capital accounts problem. As a result, the investment agreements almost always stipulate that the sponsor not claim bonus depreciation. I don’t think this has changed the past several years. As I understand these structures apply primarily to residential and commercial financing. Do these same structures apply to utility scale development and project finance? From my understanding those transactions are primarily financed with debt. Is the debt raised from partners similar to tax equity investors or in completely different capital markets as they are project based? Thanks for the article, its incredibly helpful! Sale-leasebacks are almost exclusively used in the commercial rooftop market. Inverted leases are used only in the residential market as far as I’ve seen. Partnership flips are used in the utility market. Many projects (or groups of project) also have debt, but a project financed without tax equity would be at a significant cost disadvantage unless the project sponsor itself can use all the tax benefits. Great articles. I have an investor with a large tax burden who will provide funding for a non-profit organizations’ rooftop solar PV system. He will own the system and lease back to the organization. If structured properly, can he claim the ITC and the MARCS depreciation? Your investor will probably lose the ability to take the take benefits if he leases the system to a non-profit. He should be sure to structure his agreement as a service contract (PPA). Josh, I very much appreciate your articles. My state only allows PPAs with commercial businesses if they are an affiliate of the IPP. Have you heard of any structures involving tax equity that would accommodate this restriction for commercial projects? I am envisioning a flip structure with the end user having 50% voting rights in the project company through preferred shares that give priority rights to a minority share of the cash flow to the project company. There is some precedent in CA that says the flip does not represent a change in ownership for property tax purposes. I hope someone has already solved this problem. Thanks! I can imagine a case where the commercial business (offtaker) and tax equity form an SPV (call it an IPP) that sells energy to the offtaker under a PPA. I am not sure if that is exactly what you were envisioning. It sounds like you might need to talk with an attorney about the precise definition of affiliate and whether the structure you imagine would qualify.